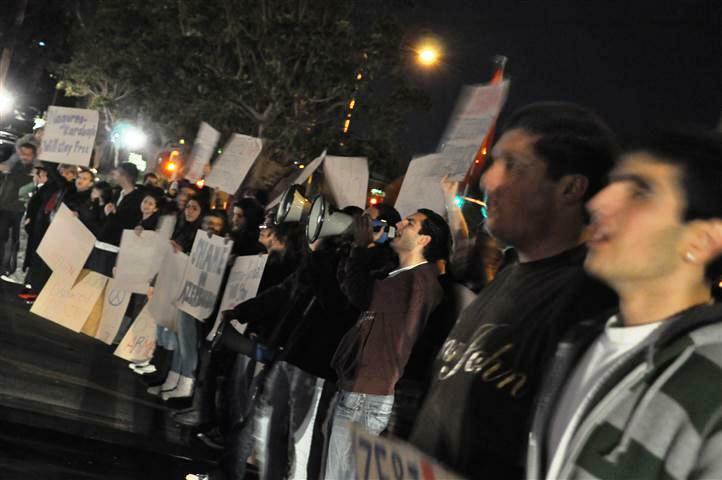 NEWPORT BEACH, CAMore than 150 members and supporters of the Armenian Youth Federation turned out at the Pacific Club on the evening of Thursday, March 4, to protest Azerbaijans Consul General of Los Angeles, Elin Suleymanov. This diplomat spoke for two hours, talking at length about how moderate, peaceful, economically stable, prosperous and wonderful Azerbaijan is, said Vache Thomassian, an AYF member who attended the event to ask the diplomat about Azerbaijans growing war rhetoric against Armenia and Karabakh. Suleymanov, would have you believe that Armenia today occupies 20 percent of Azeri territory and as an aggressor nation has displaced a million Azeris that no longer have homes. He will have you believe there were massacres that Armenians committed against innocent Azeris and that our people committed murder to live in their own homeland, said Thomassian. Incidentally, it was revealed that among the organizations board members was an Armenian-American. Serge Thomassian approached the demonstrators at close of the protest to express his admiration for their efforts, explaining that he had attempted to steer the board away from the decision to invite Suleymanov. 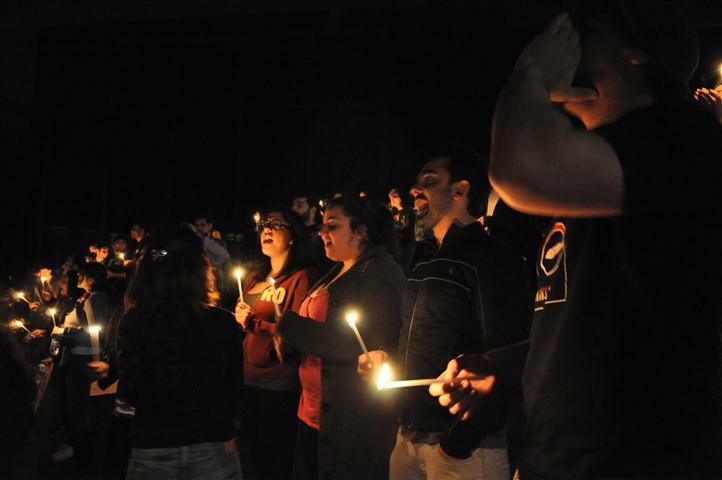 Though I was unable to convince the board to drop the speaker, I did manage to secure an event in April to commemorate the Armenian Genocide and Jewish Holocaust, he explained. The WAC board member also said that because of the protest, what was to be a one-sided lecture became an educational experience for the guests, who learned first-hand about Azerbaijans human rights violations and its denial of self-determination to Nagorno-Karabakh. This demonstration was a testament to the will of the Armenian youth and sent a clear message to the Azeri consul that we will not allow his administration to spread its war rhetoric and propaganda, whether it be here in Los Angeles, or across the globe in Azerbaijan, said Jivalagian. Santikian and Thomassian had submitted three questions during the event, all of which were asked to the diplomat. Among the questions was one asking Suleymanov to explain how his government will ensure security for international energy exports in the region when its unwilling to work for peace and constantly threatens to ignite a new war in the region. The Azeri diplomat circumvented the question, fabricating his own set of facts to support his initial claims about Azerbaijans peace-loving nature, Santikian recalled. Though a fragile state of no peace, no war has held over the years, Azerbaijan refuses to cooperate in internationally mediated peace talks with Armenia and instead threatens to take Karabakh by force. On February 25, Azerbaijans Defense Minister, Safar Abiyev, stepped up Bakus war rhetoric, this time threatening to launch an inevitable great war against Armenia and Nagorno-Karabakh. 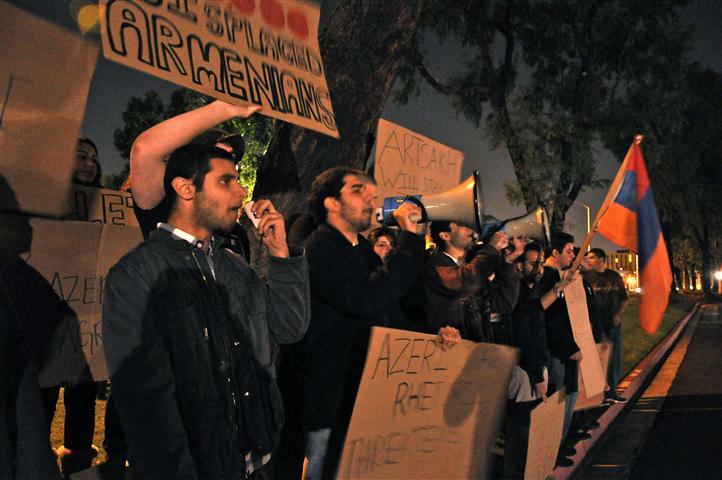 The daily recurrence of threats to invade Armenia and Nagorno-Karabakh emanating from Baku is what motivated the AYF to mobilize its membership to demonstrate against the event, explained Jivalagian. This is an issue we all hold very dear to our hearts, he said, adding that the protest also sought to remind Suleymanov that the Armenian-American community has not forgotten the massacre of Armenians in Sumgait. 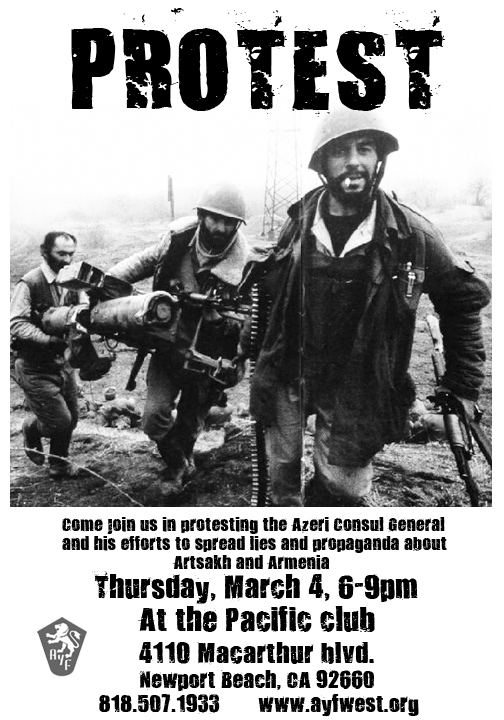 The protest came days after the 22nd anniversary of the deadly pogroms of Sumgait on Feb. 27, 1988, which marked the beginning of a systematic campaign by Azerbaijans OMON Special Forces to use massacres and violence to forcefully uproot Armenians from Azerbaijan and Nagorno-Karabakh. The events in Sumgait, which came as a direct response to Armenians expression of their right to self-determination in 1988, were followed by equally violent pogroms in the Azeri cities of Kirovabad, Baku and later in the Northern Shahoumian district of Nagorno-Karabakh. The violence against Armenians eventually escalated and Azerbaijan launched a military invasion into Nagorno-Karabakh, sparking a devastating war in the region that ended in 1994 with a ceasefire that left the Nagorno-Karabakh Republic free from Azeri rule. Diplomats from Azerbaijan tour the world talking about how Armenia is an aggressor nation and that Azerbaijan must defend its territorial integrity from the Armenians. 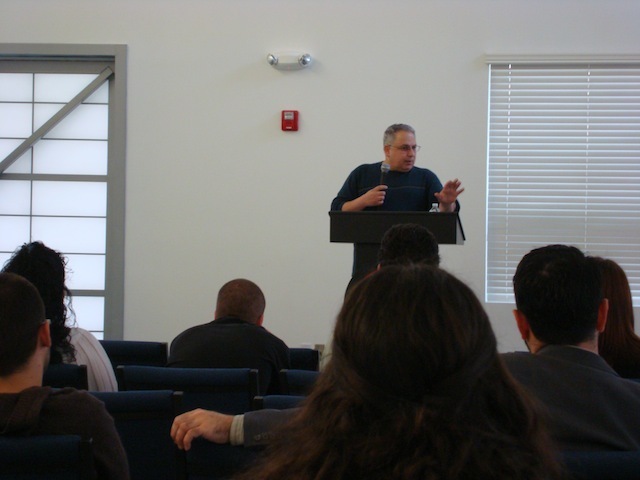 GLENDALE, CA-On Sunday February 28, the Armenian Youth Federation hosted a community forum on the Armenian Genocide Resolution led by former Armenian National Committee Western Region Chairperson Vicken Sonetz-Papazian. The town-hall style event is the latest in a series of forums organized by the AYF to educate the public on the proposed measure. Sonentz-Papazian described the resolution as an important vehicle that raises the profile of human rights issues that are ongoing until today in different ways. He also discussed the evolution of the battle to gain official recognition of the Turkeys crime, from the introduction of the first resolution in 1975 by Rep. Tip ONeil, when the Turkish lobby was unorganized and unable to oppose the bills passage, to the present day situation in which Turkey spends millions of dollars a month to ensure its failure. This fight against US recognition is among todays greatest ongoing violations of human rights, he explained. The killing ended in 1923, but since that time, there has been a very insidious cover up that has taken many forms, from the eradication of archival evidence to a very systematic campaign to wipe out any trace of an Armenian existence in Western Armenia, he said. After speaking about the history of the resolution and the political landscape surrounding it today, Sonentz-Papazian led a discussion about ways to get involved to ensure its passage. What you can do, first and foremost, is contact your elected representative–and if they are a cosponsor–you need to let them know that we are not interested in moral victories but real victories. We are interested in winning on this and advancing that Armenian case, he said. The majority of Sundays participants reside in Congressman Adam Schiffs district. Sonentz-Papazian said it was vital for everyone to let Schiff, who is the author of the bill, know that we want him to lead the bill to a victory. The playing field is really uncertain now for congressman, he said pointing to the recent election of a conservative male model as the new congressional representative in the largely liberal state of Massachusetts. Santikian, for his part, said the AYF is encouraging the Armenian Community to remain informed and engaged to ensure a swift full house floor vote of the resolution. 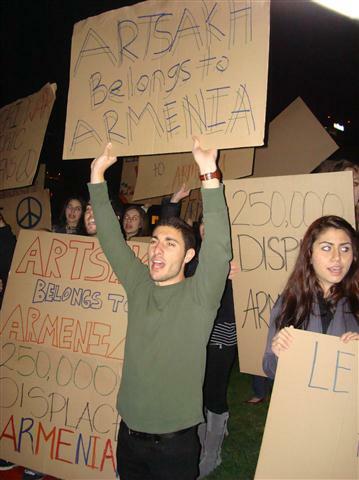 Founded in 1933, the Armenian Youth Federation (AYF), with chapters throughout the United States and affiliated organizations around the world, has grown to become the largest and most influential Armenian American youth organization. Inspired by the past and motivated by the needs of the future, the AYF actively strives to advance the social, political, educational and cultural awareness of all Armenian youth. More information about the AYF can be found at: www.AYFwest.org. The members of the community are always excited to hear from the younger generation about something they care about remarked Sose Axian, a member of the Glendale AYF “Roupen” Chapter, who participated in the phone banking. The phone banking is part of the AYF Western Region Teachathon 252 Campaign to educate the community on the upcoming vote in the House Foreign Affairs Committee. The Armenian Youth has played a strong role in past efforts to bring the resolution to the full house floor remarked Ishkahn Boghosian, a representative from the AYF. Its important we all remain informed and proactive. G LENDALE–The Armenian Youth Federation will beprotesting Azerbaijan’s Consul General of Los Angeles, Elin Suleymanov, at the Pacific Club (4110 Macarthur blvd. Newport Beach, CA) on Thursday, March 4 from 6-9pm. Suleymanov will be speaking about Azerbaijan’s role in the world at an event sponsored by the World Affairs Council. The Azeri diplomat will also be discussing Azerbaijan’s position on Nagorno-Karabakh and Armenia. The protest comes days after the 22nd anniversary of the deadly pogroms of Sumgait on Feb. 27, 1988, which marked the beginning of a systematic campaign by Azerbaijan’s OMON Special Forces to use massacres and violence to forcefully uproot Armenians from Azerbaijan and Nagorno-Karabakh. Though a fragile state of “no peace, no war” has held over the years, Azerbaijan has refused to cooperate in internationally mediated peace talks with Armenia and has instead threatened to take Karabakh by force. On February 25, Azerbaijan’s Defense Minister, Safar Abiyev, stepped up Baku’s war rhetoric, this time threatening to launch an inevitable “great war” against Armenia and Nagorno-Karabakh. These remarks, explained Jivalagian, are part of a well-documented pattern of threats and corresponding cease-fire violations initiated by the Azerbaijani Government.